EAST TEXAS (KLTV/KTRE) - Good morning, East Texas! 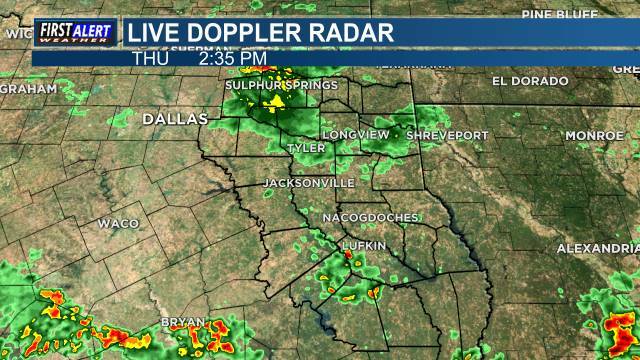 Here’s the weather where you live: A few showers in Deep East Texas this morning with light to moderate rainfall. Another day with a mix of clouds and sun through the afternoon. Shower activity will stay in southern counties today. Temperatures will reach the upper 60s to near 70 degrees this afternoon. Mostly cloudy tomorrow with temperatures in the 50s to start the day. Chances for rain become likely late tomorrow along a cold front. High temperatures Wednesday will only reach near 60 degrees and will fall into the 50s for Thursday behind the front. The likely chance for rain will be right along the cold front, mostly overnight Wednesday into early Thursday. Rain should end across all of East Texas by Thursday afternoon. Sunshine returns on Friday and temperatures begin to warm up. A beautiful weekend is ahead with mostly sunny skies and temperatures back closer to normal in the lower 70s. A good chance for showers/isolated thunderstorms late on Wed/early Thursday. Rain prior to and after this time period is possible.